It is 25 years since cricket commentators Brian Johnston and Jonathan Agnew famously got the uncontrollable giggles on live radio, while reporting on that day’s Test Match between England and the West Indies. The pair were commentating on the wicket of England’s Ian Botham, when he stumbled on to his stumps and, as Agnew put it: “Didn’t get his leg over”. The resulting infectious two minutes of laughter has since been voted the greatest moment of sporting commentary ever. It’s worth listening to again – see if you can help giggling along with them. I research the neurobiology of human vocal communication, and recently I’ve been spending a lot of time looking at laughter, which is easily the most common non-verbal emotional expression which one comes across (though in some cultures laughter is rather impolite and can be less frequently encountered when out and about). There are four key features of the science of laughter that this the Botham clip illustrates. The BBC has rather strict rules about sports broadcasters expressing too much emotion when reporting – you are not supposed to let your voice “break” (start to lose control). Why, then, do two professional sports broadcasters let this happen? The short answer is it’s an involuntary vocal emotional expression. Involuntary emotional expressions are controlled by an older evolutionary pathway than the neural pathways involved in the production of speech. This pathway controls vocal behaviour in all mammals (unlike the voluntary pathways that we use behaviours like speech and song). In ways that we still don’t fully understand, involuntary vocalisations like laughter (or screaming in terror) can prevent us from speaking at all – in the clip, it’s clear that they’re not just laughing through their speech, their speech keeps getting stopped in its tracks, frequently midway through a word. This is why, when you start to seriously get the giggles, it can be basically impossible to prevent them from taking over – as Jim Naughtie found when he blundered when introducing Jeremy Hunt, although he recovered masterfully. In addition to the helpless giggles it has been suggested that there is a second kind of laughter. We laugh very frequently in conversation, and neuroscientist Robert Provine has shown that this conversational laughter is really tightly coordinated with that of the people we are talking to. This conversational laughter differs from helpless laughter – it sounds different and it stops and starts really quickly, unlike helpless laughter, which can take a longish while to start. It may also be under rather different neural control. What happens to their voices? When we speak, we use the muscles in our rib cage (the intercostal muscles between the ribs and the diaphragm) to produce a very finely controlled flow of air through the vocal folds in the larynx. We then shape the sounds made at the larynx using our articulators (the tongue, lips, soft palate, jaw). Lots of different factors affect how we sound when we speak, including our emotional state – if someone is smiling when they speak, for example, it changes the voice and listeners are sensitive to this “audible smile”. When we start laughing, the muscles in the rib cage start to produce large contractions – which simply make a noise by squeezing the air out of the body. Each “ha” in a laugh reflects one big contraction. When the contractions run together this leads to a longer spasm, which sounds like a high-pitched wheeze. 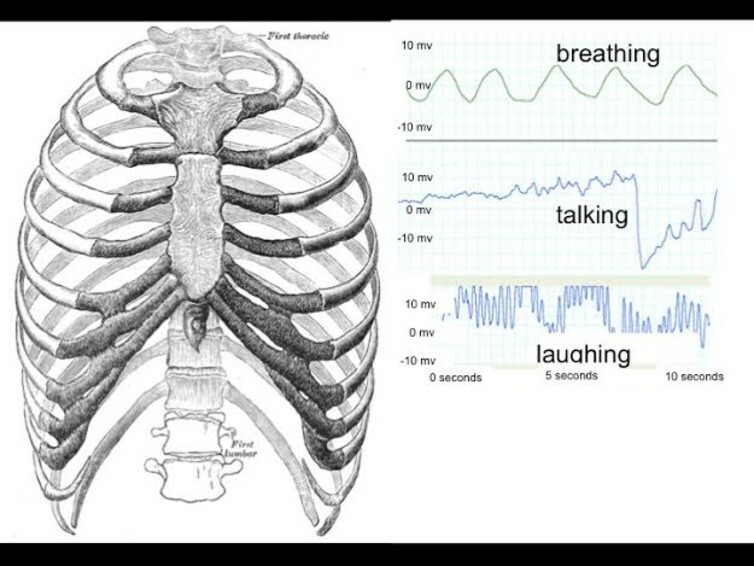 The forces generated by the muscles of the rib cage are much greater than those used during normal speech, and this means that laughter can be very high pitched (my laugh is pitched far higher than I could ever sing, for example). This also means that is people try to speak through laughter, the pitch of their voices can be highly uncontrolled, and can shoot right upwards. All of these changes can be heard in the legover clip – Johnston starts with an audible smile, starts to laugh, stops being able to speak, produces high-pitched wheezes and, when he manages to speak, does so with a really high-pitched voice. You can hear in their voices a slight embarrassment at having to discuss exactly what Botham’s inner thigh is doing, at the top of the clip. I can empathise. In this context, Agnew makes a little joke about “legovers” – but, very quickly, he and Johnston are not laughing because this is a very funny joke, they are laughing simply because they are both there, and they are laughing. Provine also showed that laughter is highly contagious – one can often catch a laugh from someone else simply because they are laughing, not because of why they are laughing. And laughter primes laughter – this is why comedy shows use warm-up acts, as people will laugh more if they are already laughing. In the legover clip they are pretty soon only laughing because they are both laughing – and they just keep on setting each other off (which is why Johnston pleads: “Aggers, do stop it!”). This behavioural contagion rather than the hilarity of the legover comment) is probably why this clip still makes me laugh, and I have been listening to it, analysing it and playing it to people for over ten years. Why is it delightful to listen to? Provine has argued that although we think of laughter as being caused by jokes, it is actually a social behaviour that we do when we are with other people. Laughter is less to do with humour and more to do with making and maintain social bonds. We are 30 times more likely to laugh when we are with someone else than when we are on our own. Laughter: works better in company. So it’s likely that had Agnew been on his own, and made the legover joke, that he woudn’t have been overcome with giggles in the same way. Indeed, he would probably not have laughed in the same way had he been doing a broadcast with someone that he did not know – laughter is much less behaviourally contagious from someone who is unfamiliar to us. From the first audible smile that we can hear in Johnston’s voice, we’re aware that these are two men who not only know each other, but sound like they probably like each other. Work by Laura Kurtz and Sara Algoe showed a correlation between the amount of laughter that couples share, with other indices of the strength of the relationship – from emotional support through to emotional closeness. Of course the direction of this relationship remains unknown – do we laugh more with those we love because we love them, or does it make us love them? It would also be interesting to speculate whether this might be extended to other close relationships, like friendship. It is certainly hard to imaging that Johnston and Agnew would be laughing like this if they detested each other. Laughter has been described by Victor Borges as “the shortest distance between two people”, and I suspect that, ultimately, this is what we are hearing, even at the distance of 25 years: the sound of genuine, joyous, shared emotion.